CLAUDIA is LEDiL’s newest glare controlled linear lens family for cost-effective retail lighting. 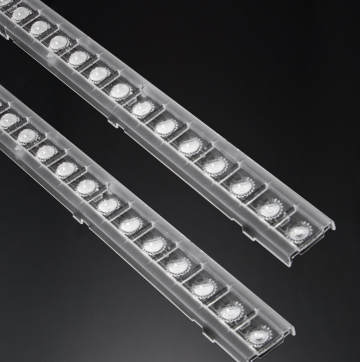 The unique optical sun pattern design delivers smooth light distribution with good vertical illumination, perfect for supermarkets. CLAUDIA also offers tunable white, giving full control of colour temperature and intensity to create a variety of mood-based retail environments. Zhaga book 7 PCB compatible and made of highly efficient PMMA, CLAUDIA has over 90 % efficacy and is optimized for 2835 and compatible with up to 5630 size mid-power LED packages. With a simple clip attachment CLAUDIA couldn’t be easier to install, making it the affordable choice for quality optical performance.